What is simultaneously comforting and alarming about my domestic incompetence is that I am hardly alone. I’m joined by millions of women, GenXers and Gen Yers, who either have consciously rejected household endeavors in favor of career or, even more likely, were simply raised in the ultimate age of convenience and consumerism. Why do for ourselves, we shrug, when we can pay someone else to do it for us? We have now entered what experts are calling the worst economic crisis since the Great Depression. Suddenly, not knowing how to cook my own meals, care for my own house, iron my own shirts, even make my own entertainment (hello, cable!) seems not only disempowering, but also downright irresponsible. Last December, when I posted my blog The End of the Age of Materialism, I had intended to write more about my experiments in simple living. So far I haven’t been that successful. But today I hope to start something new – a series of blog posts (about one per week) focused on tips in simple living. Some posts will be inspired by Erin Bried’s book, others from my own experiences in try to reject over-consumerism and over-consumptionism. Yes, I will also continue my adventure and activist blog posts, and I’m super excited about my new Around the World Virtual Book Club. 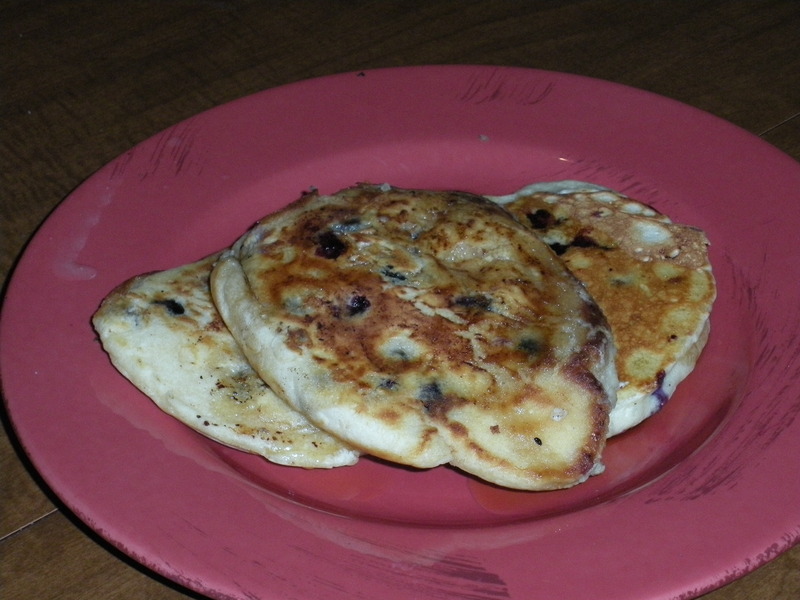 My husband will be the first to point out that I am not the most skilled person in the kitchen, and this morning I attempted to make blueberry pancakes from scratch. 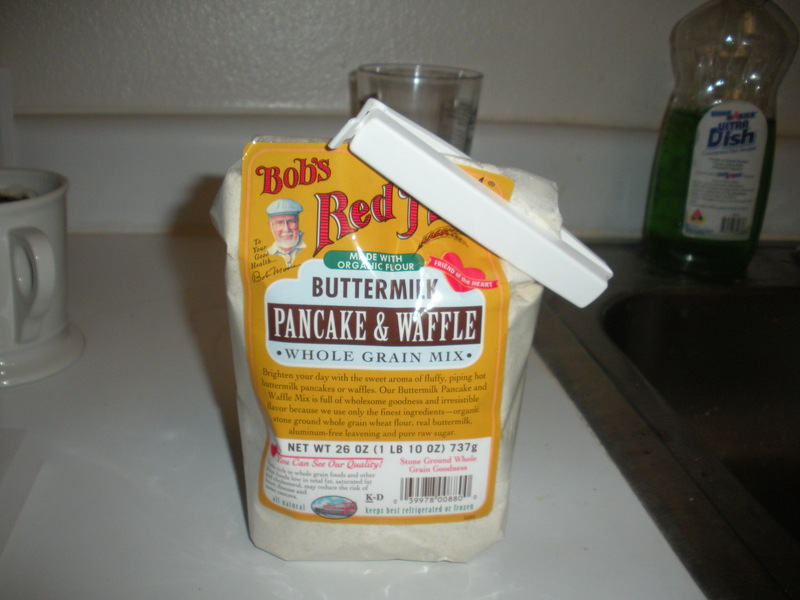 We do make pancakes and waffles quite a bit at home, but I generally cheat and use Bob’s Red Mill Buttermilk Pancake and Waffle Whole Grain Mix. 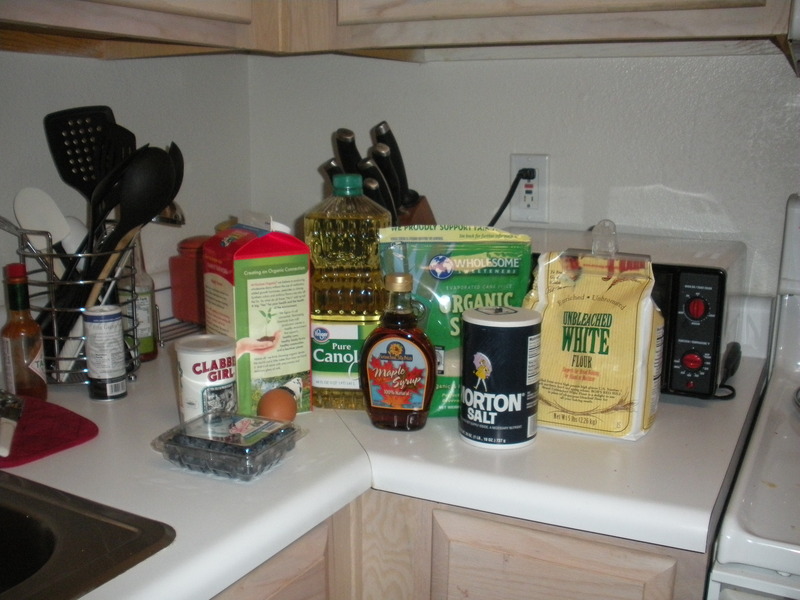 For 2 servings, the ingredients are pretty simple: 1 egg, 1 cup of milk, 2 tablespoons of canola oil, 1 tablespoon of sugar, 1 1/4 cups of flour, 1/2 teaspoon of salt, 3 teaspoons of baking powder, and 1/4 cup on blueberries. First, mix the egg, milk, oil and sugar in a large bowl. As I am a super simpleton, I don’t even own electric mixers, and an egg whisk works pretty good. Next, add the flour, salt, and baking powder and stir with a spoon. 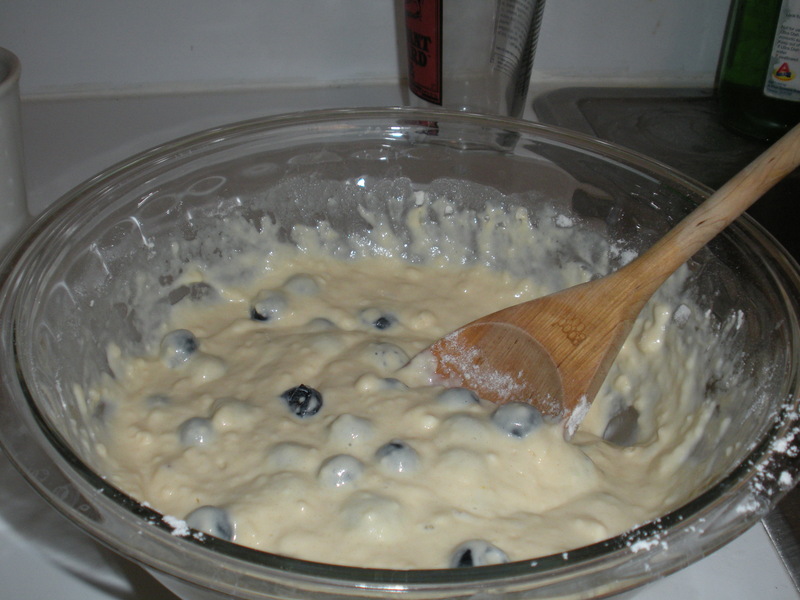 Finally add the blueberries and your batter is ready to go. As I don’t own a griddle either, I used a large frying pan. Setting my stovetop to medium, I added about 1/2 tablespoon of butter to the pan for each round of pancakes. The biggest challenge for me was waiting for the pancake batter to bubble enough to indicate it was time to flip it over. My impatience led to one semi-mutilated pancake in the first round of cooking. After three rounds of two pancakes each in the frying pan, breakfast was served. We applied 100% Grade A maple syrup from Canada liberally (forget about the imposters made with high-fructose corn syrup). The husband’s verdict? Not too bad, but I think he like the Bob’s Red Mill batter a bit better. 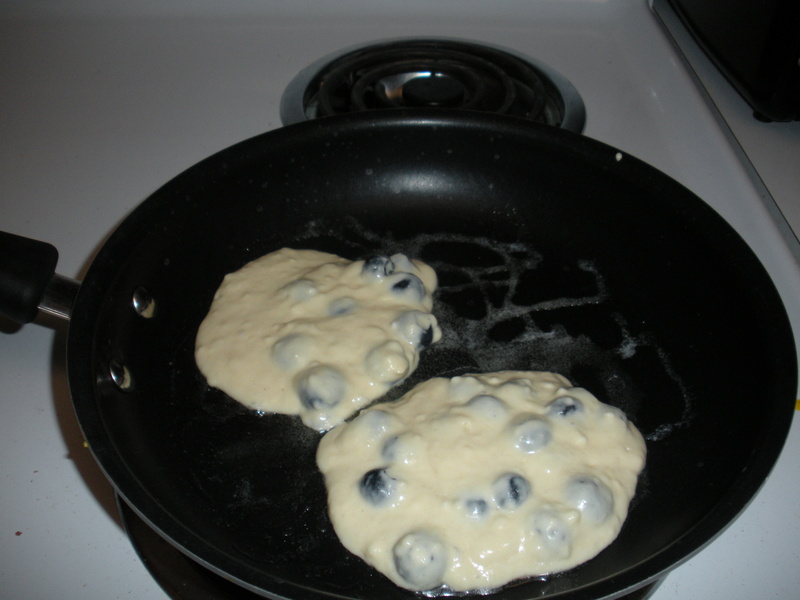 This entry was posted in DIY, The Simple Living Experiment and tagged blueberries, blueberry pancakes, breakfast, DIY, recipes, simple living. Bookmark the permalink. I finished reading “Not Buying it” last weekend at the Blues Festival. I really liked it, and it wasn’t preachy at all. Unfortunately, the next day I bought a Kindle and then went clothes shopping with my mom. So far, I’ve failed at not buying it. However, I did just cash out a tiny retirement account that I had from one of my many jobs. I decided that the taxes I would owe for early withdrawal would be offset if used all of the money to pay down one of my credit cards. I am happy to say that as soon as I got money, I paid my credit card, and shredded my card.